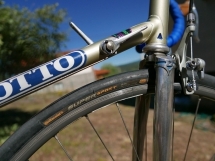 The Benotto is an Italian road bike. 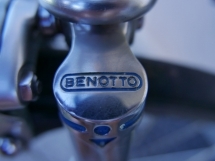 It was Giacinto Benotto, a professional road bike racer, who founded the bicycle manufacturing company in Torino, in 1931. 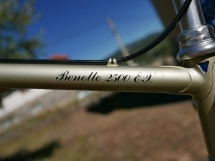 The Benotto 2500 EX was for some time their top model. 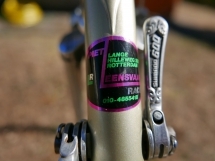 I found this Benotto 2500 EX road bike on the Dutch Marktplaats, this is our national eBay. 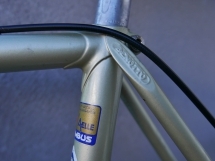 The bike had a flat handlebar, because the seller, an older man, preferred a more upright position. 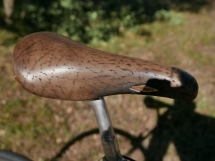 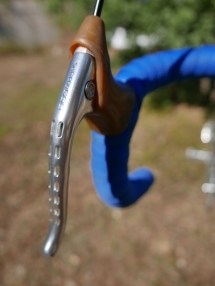 The original handlebar was lost. 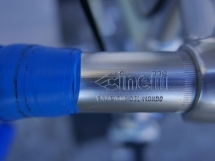 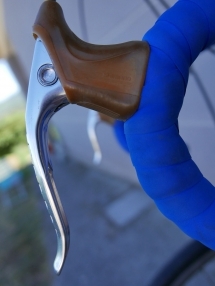 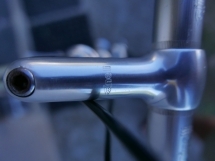 I equipped the bike with a Cinelli stem, Cinelli drop bars and Shimano 600 brake levers. 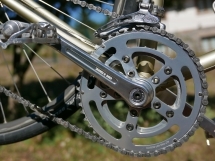 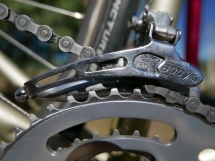 The original crankset was a Shimano 600 Arabesque double 52 x 42, I changed this for a new (square taper) compact crankset from On One, a 48 x 34. 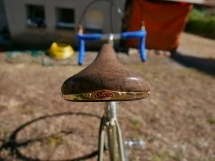 A compact is much better for cycling the Eroica, but not so good for the ‘Concours de Elegance’, however it looks sufficient ‘vintage’ in my opinion. 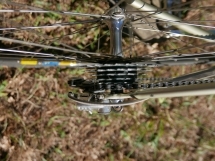 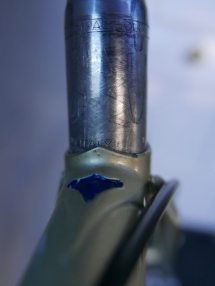 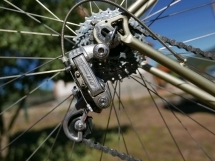 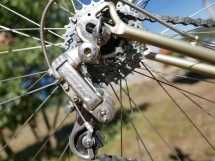 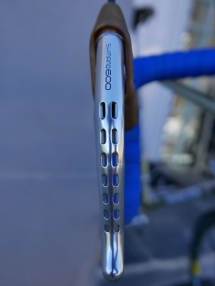 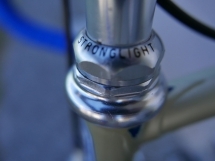 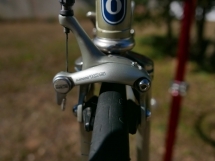 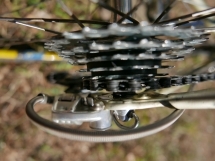 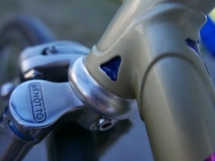 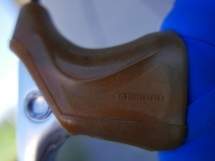 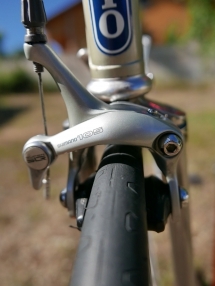 The bike was also equipped with not so vintage brake callipers, Shimano 105, but they functioned perfectly, so they stayed on the bike. 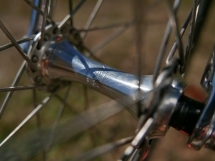 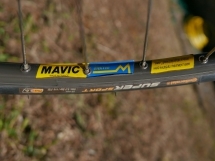 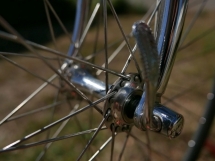 And the clincher tyres that I could fit on the bike are 28 mm wide, much wider than in the vintage days, with the narrow tubes, but the wider tyres add to the comfort and help to avoid punctures. 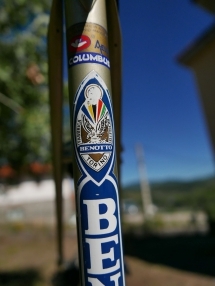 Benotto is well known for a in that time very popular bar tape, the Benotto Professional Cello-Tape for handlebars. 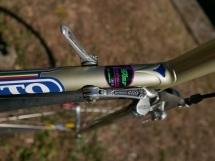 The original Benotto tape however is very thin and uncomfortable, I used thicker bar tape. 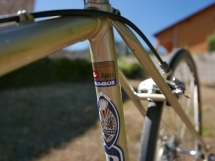 The long route of the L’Eroica Hispania 2016 was ridden with ease on this bike, no technical problems, no punctures. 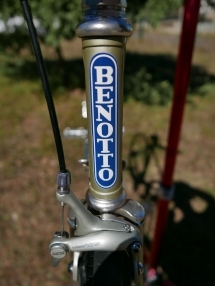 The two most prominent achievements in the track record of Benotto road bikes are the 1977 world road racing championship in San Cristobal, Venezuela, that was won by Franscesco Moser on a Benotto bike, and the hour record in 1968 of 48.653 km on a Benotto bike in Mexico City by Ole Ritter. 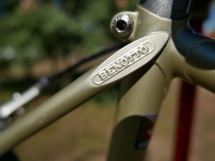 A Benotto bike plays a star role in the documentary “A Sunday Day in Hell” about the 1976 Paris–Roubaix bicycle road race. 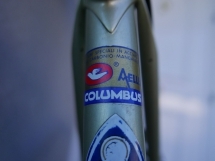 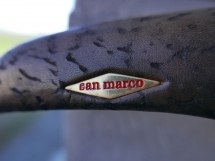 The movie starts with a long shot in which Francesco Moser’s mechanic prepares his Benotto bike, just before the race. 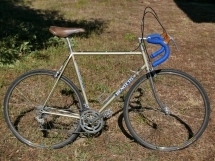 It is a Benotto bike in exactly the same colors as my bike. 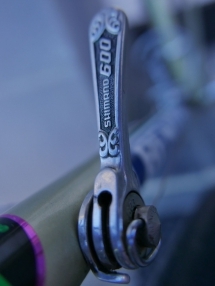 Watch it on YouTube!